As a general rule, most shower gels or soaps strip my skin and leave it dry, regardless of how much I moisturise afterwards, so soap and I have a somewhat…strained relationship. However, I have found a cleanser that doesn’t strip my skin and has actually helped the condition of it. I don’t have problem skin (anymore…) but I do tend to develop blemishes and marks on my back, shoulders and upper arms. Not a serious problem, it’s not ruining my day, but gah, it is annoying. 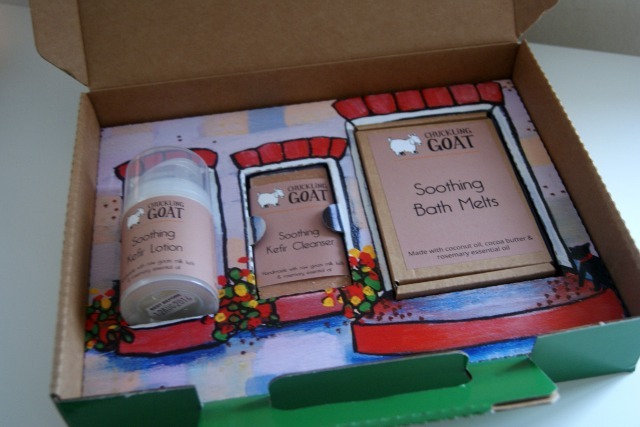 Enter some lovely goats and their kefir cleanser (and of course, the lovely humans to help them share it with the world) and Chuckling Goat is sorting my skin right out. The magic ingredient in Chuckling Goat is kefir, which (to the uninitiated) is fermented goats milk, full of probiotics and reported to have numerous health benefits when drunk as it boosts healthy bacteria in the gut. 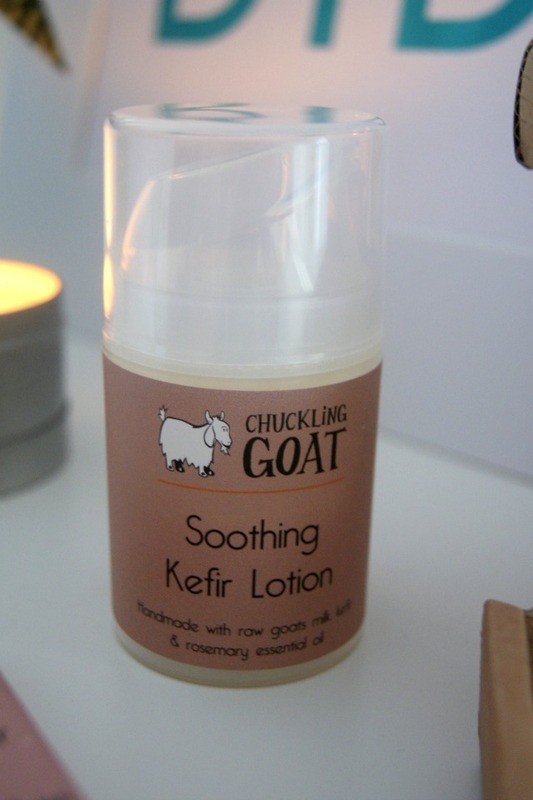 Chuckling Goat suggest combining kefir based skincare with drinking the milk to help combat skin issues like eczema and acne (to name just a couple). I was lucky enough to be given the chance of trying out a Chuckling Goat toolkit*(£19.95) and now I’ve used it continuously for a couple of months, I’m really pleased with how it’s helped to reduce the marks on my upper body. My first impression on opening the box was that it is blummin’ beautiful. 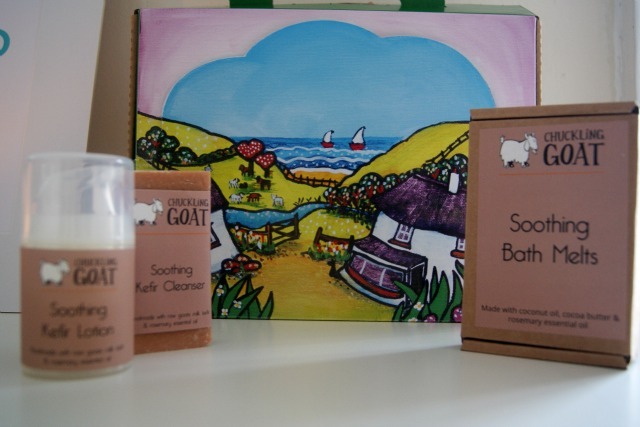 It’s painted by a local artist, Helen Elliot, and sets out the farm where Chuckling Goat HQ is based. You also get a lovely, spa like smell as soon as you open the box. I tried the Soothing range which is scented with rosemary, but several other options are available. 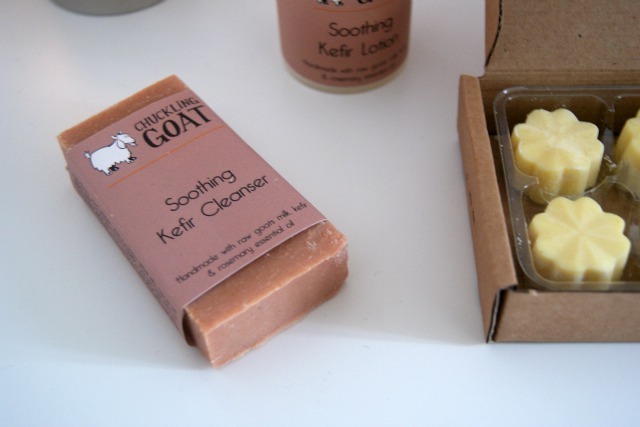 My favourite from the toolkit is the kefir cleanser, although I have to say that it didn’t work for me on my face. I have slightly sensitive skin and this made it feel a little bit tight after cleansing. My face didn’t seem noticeably dry but it’s a feeling that I’ve been conditioned against so I preferred using this as my body cleanser. This leaves you feeling squeaky clean and lightly smelling of rosemary. The kefir lotion was something I spent a little bit more time adapting to. When I look back on when I started using this, I remember not being too enamoured with the smell. I now don’t notice it at all which leads me to think maybe I didn’t like the smell because it wasn’t something I was used too. Now I just smell rosemary kefir lotion and I am more than happy to slap it on liberally. All I’ll say is that if you haven’t tried this before, the smell might be something that doesn’t immediately attract you, but don’t let that stop you giving it a good go. The lotion itself is light, easily absorbed and I credit this and the cleanser together with clearing the skin on my shoulders and arms. 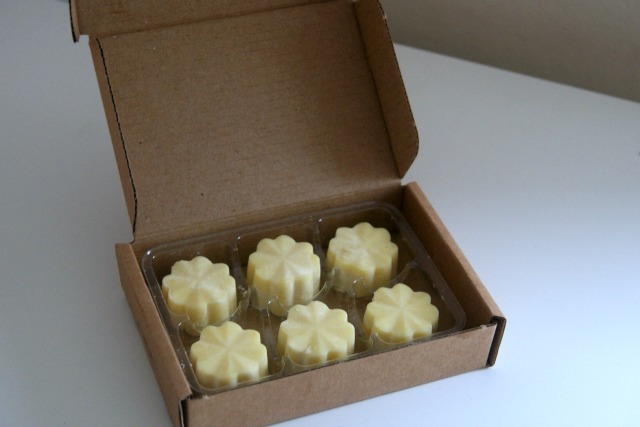 The bath melts are a mix of rosemary, coconut oil and cocoa butter (three of my favourite things). Pop one in your bath and it makes a lovely, skin softening addition and spreads that spa like smell even further. As a special treat, the lovely people at Chuckling Goat have a special discount code if you’d like to get in on all that kefir action. Just add PaperBeauty10 at the checkout and they’ll knock 10% off your entire cart (excluding shipping costs).